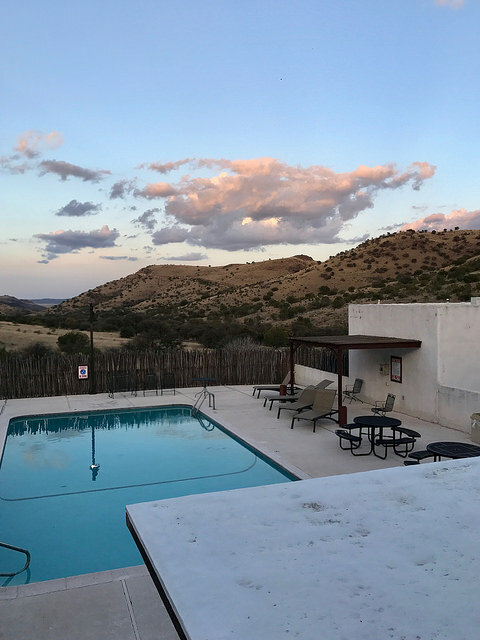 We see Indian Lodge on a hill up ahead not long after entering Davis Mountains State Park. It’s impressive. I develop an instant fondness for this collection of buildings on the hill. Their presence here is a result of an enormous effort by the federal government, state government, and the physical labor and talents of several hundred thousand people. 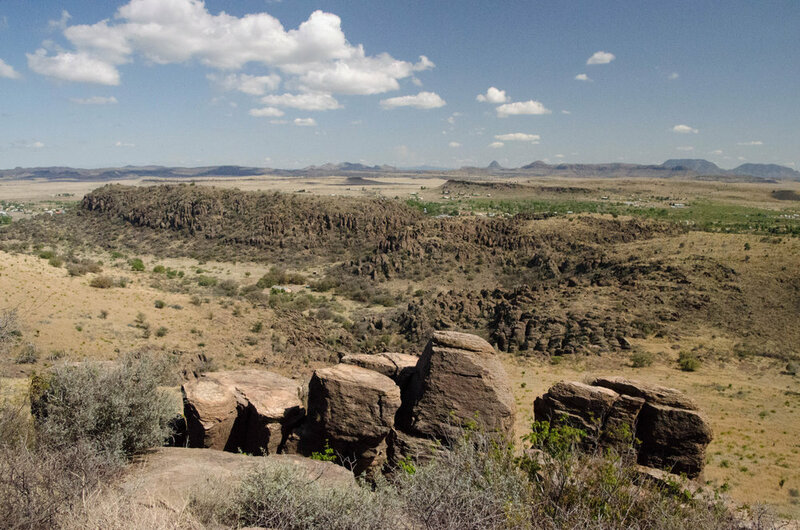 Their efforts had an impact on not just Davis Mountains State Park, but also on numerous other Texas state parks and public spaces; the work of a generation and a gift that keeps giving. The Civilian Conservation Corp was founded during the great depression in response to a desperate need by many Americans for work capable of putting food on the table. After President Roosevelt was inaugurated in 1933 he soon set to work implementing the public works projects of the New Deal, a large component of which was the CCC. On the Texas Parks and Wildlife Department website, I found a beautiful excerpt from a speech President Roosevelt gave in 1933. Directed at the CCC, he said “It is my belief that what is being accomplished will conserve our natural resources, create future national wealth and prove of moral and spiritual value, not only to those of you who are taking part, but to the rest of the country as well.” Eighty four years later, we have no problem recognizing how right he was. In 29 of Texas’s state parks today, we are privileged to enjoy the hard work of so many. If you haven’t already clicked on the link to the state parks website I included above, I promise you won’t regret spending time reading through it. Included are black and white pictures taken during construction and development of all the CCC parks in Texas. 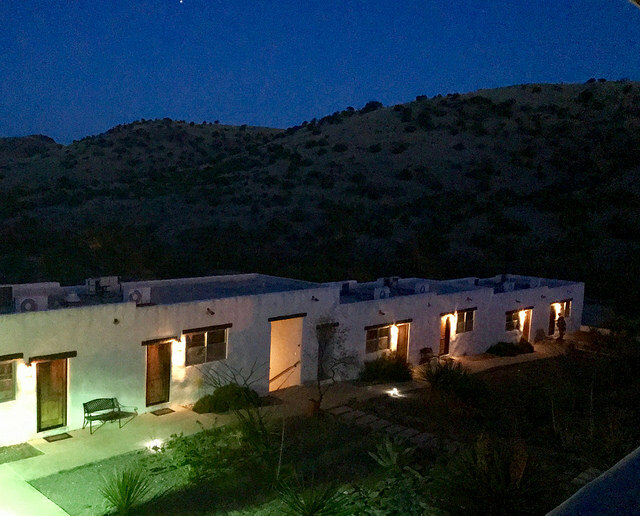 The rooms we’ve booked at Indian Lodge are located in an addition built in 1965. Although it’s newer, it was built to match the original buildings from the 1930s. I expect some nice rooms but still feel a sense of surprise at how large they are and how light, clean and inviting they look. I definitely wish we could spend more than one night here! The beds are positioned under windows that open to an incredible view. When bed time arrives, I lay my head on the pillow and look up at the stars. West Texas night skies are known for their minimal light pollution. There’s no question that I’m seeing more and farther than what the night sky in Houston has to offer. I must admit that the tears well up in my eyes as I suddenly feel an enormous sense of gratitude for being here and seeing this. This is the power of nature and the experience that our state parks can offer us. 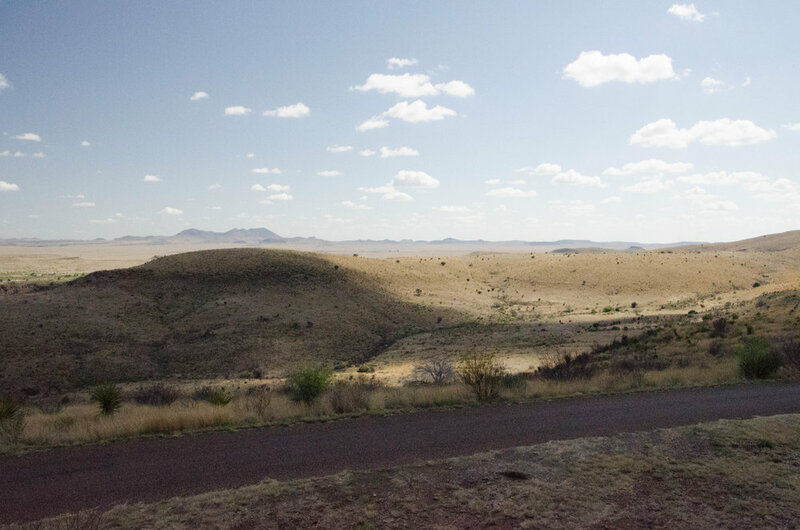 The Davis Mountains are the result of volcanic eruptions that took place over thirty-five million years ago. A few million years after the first series of eruptions, a second eruption began but never reached the surface. Instead, it created an uplift that forced the lava flows of the first event to be pushed further up. 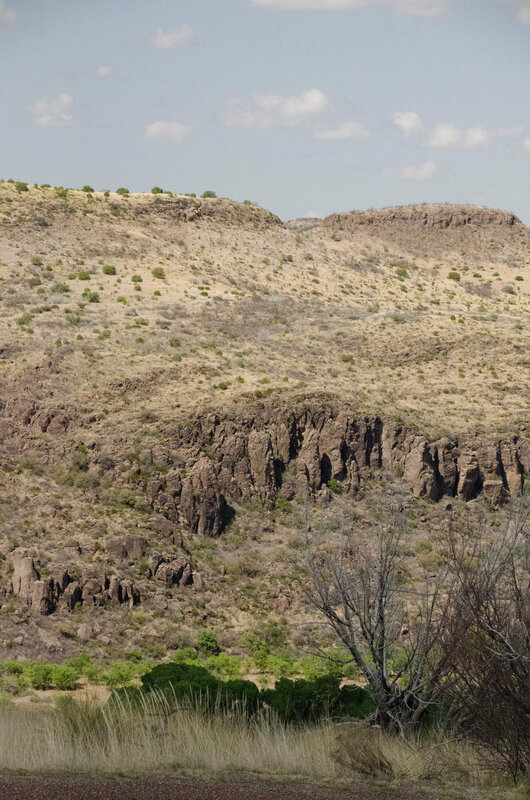 That uplift results in the dramatic rock formations we see in the Davis Mountains today. Since we don’t have much time to explore the park, we decide to drive up Skyline Drive and stop the car as often as the road allows. I have fun taking pictures of the road ahead of us every time it seems to just disappear into the blue sky. Once we reach the top, we realize just how abrupt the volcanic uplift really is. Normally, mountains will gradually drop away into the distance until they reach flat ground, but here the rocks seem to just drop straight down to the surrounding prairie. It’s unusual and makes this photographer feel that it requires at least 1,000 pictures to properly document. Sitting at home, editing 1,000+ pictures a few days later, I’m wondering what got into me. I guess that’s just how I react when loss of breath causes a lack of oxygen to the brain. Incredibly beautiful scenery… there’s no other possible explanation. The next morning I’ve set the alarm to go off while it’s still dark outside. Before long, I’m drawn to the window with the incredible view because it’s becoming apparent that the sun is hiding just behind the mountain. The shower is put on hold so I can go out and get a couple of pictures. Before long, I realize I’m taking quite the tour of Indian Lodge while in pursuit of the best sunrise viewing area. I even consider heading out into treacherous cactus country. Remembering my earlier run-in with a cactus, I fortunately come to my senses. I finally locate the perfect spot and proceed to take another 1,000 pictures, leading to another forehead slapping moment a few days later. It was a beautiful sunrise and it precipitated another experience of intense happiness. 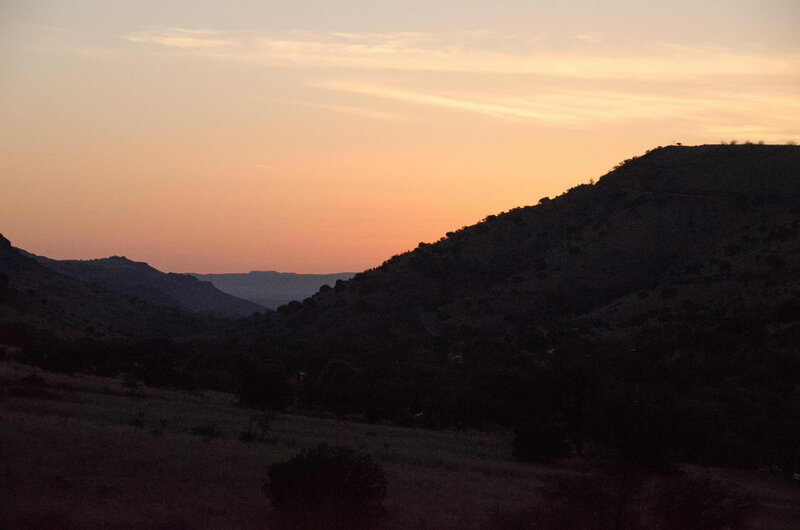 I’m emphasizing all this so that you’ll keep the sunrise in mind if you visit Davis Mountains State Park. Do not sleep in and miss it. What an incredible experience! Come back next week as we continue on to Balmorhea State Park and Monahans Sand Hills State Park.